Howdy, folks! The NBA season is finally upon us, and as Duke fans, we are lucky enough to have plenty of former Blue Devils to watch in the league. However, there are four former Blue Devils who may be playing their first years of professional basketball this year – and I’m here to talk about each one of them. We’ll start with a guy who’s been #1 on the court and #1 in all of our hearts here at Crazie Talk for quite some time – Kyrie Irving. As the first overall pick in the draft (and Duke’s first overall pick since Elton Brand), Kyrie certainly has high expectations for himself for his rookie year. As we were able to see in person (albeit briefly), Kyrie’s ability to change speeds and use his instincts to control the game make him the best point guard prospect in years and earned him comparisons to none other than Chris Paul. Irving did pretty well in his preseason debut for the Cavs, collecting 21 points on 4-14 shooting and making a living at the free throw line. He struggled in his second preseason contest, but continued to get to the charity stripe with success. Because of Cleveland’s personnel (or lack thereof), it seems likely that the majority of the Cavs offense will come from Irving penetrating and/or getting to the line, or in transition with Kyrie running the break. The image of Irving leading the break will become a familiar one this season, as the Cavaliers find ways to manufacture offense. After years of searching for secondary scoring in support of LeBron James, they must generate it by committee in a rebuilding season. Irving has shown the willingness and fearlessness to play that style. In preseason, he averaged 16 points and got to the line 16 times, converting 14 free throws. But is the 6-2, 180-pounder durable enough to absorb the elbows and forearm shivers that come with repeatedly driving the lane? [Cleveland forward Antawn] Jamison said Irving is still learning some of the finer points of the position but enjoys watching him run the floor and create offense. Although Kyrie came off the bench behind Ramon Sessions during the preseason, expect him to get the starting nod sooner rather than later. The Cavaliers’ best chance of success lies with Irving running the show. While the post-LeBron rebuilding process will take some time, having a guy like Kyrie at the helm makes for a bright, bright future. 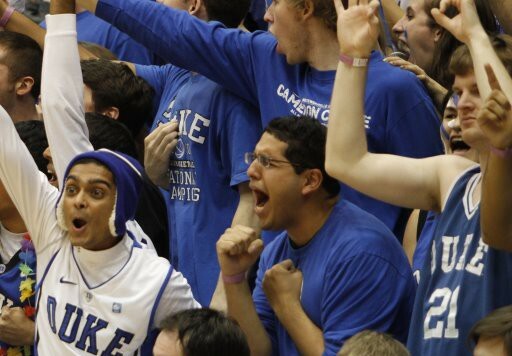 Of course, Kyrie is not Duke’s only alum who plans on making his debut in the NBA next week. One of our favorite Dukies ever – Mr. Nolan Smith – will make his NBA debut with the Portland Trail Blazers on Monday against the Sixers. Unlike Kyrie, who has been forced to learn the ropes himself, Nolan has had the opportunity to learn under another former Tobacco Road lead guard – Raymond Felton. When the Trail Blazers introduced Felton and Smith during a June news conference, they touted the duo as the franchise’s present and future at point guard, proclaiming that they would be a fixture in Portland for years to come. Tonight, when the Utah Jazz visit the Rose Garden in the Blazers’ exhibition opener, Blazers fans will get a first look at what this future holds. There is a bubbling feeling among the Blazers that the team will be a particularly tight-knit group, that chemistry and togetherness will be trademarks of the lockout-shortened 66-game season. This is particularly evident at point guard, where Felton has pushed ego and competition aside to assume a mentorship role with the rookie Smith. You should definitely check out the rest of Freeman’s piece on the relationship between Ray and Nolan – but it’s safe to say that Nolan is in a great position to start his career. Currently, he stands to be the backup point, paired with another former Dukie – Elliot Williams – as the backup two guard. Aside from the 27-year old Felton, Portland is young in the backcourt – Smith is 23, Williams is 22, and starting SG Wesley Matthews is 25. That core is only going to get better with time – and we know from first-hand experience that Nolan has consistently gotten better over the years. The Blazers should be a pretty decent team this year, and I’m definitely excited to watch Nolan play and progress this year. If you were to tell me that Lance Thomas would be the first player from Duke’s 2010 National Championship team to play in an NBA game, I would have thought (with good reason) that you were crazy. Lance proved the doubters wrong last week as he made the start for the New Orleans Hornets against the Memphis Grizzlies, scoring 7 points and grabbing 8 boards in 30 minutes of action. He was much less effective in the Hornets’ second preseason contest, but he may have a shot at making the regular season roster. Though New Orleans has brought in quite a few bodies to fill the frontcourt – Jason Smith, Gustavo Ayon, Emeka Okafor, and Chris Kaman, among others – Hornets coach Monty Williams has been impressed with Lance’s effort thus far. As an able defender with size and a relentless motor, Lance could very well turn into a high energy glue guy in the league. Here’s to hoping he makes the final cut in N’Awlins. Ah, the lone wolf of the pack – Kyle Singler. As many of you know, Kyle elected to remain in Spaininstead of heading back to Detroit to join the Pistons as their second round draft selection. He signed on with Real Madrid for the remainder of the season, after averaging 15 points in nine games for Alicante. While many NBA players returned back to the U.S from European or Chinese leagues, Singler was one of the few who elected to remain overseas. Moving to the Spanish capital has given Singler the chance to play in the Euroleague, where he debuted Wednesday and scored eight points in 24 minutes in Madrid’s 101-83 win over Partizan. Singler said the Pistons were eager for him to return. It is great to see Kyle doing so well in Spain; his play will almost certainly earn him a raise when he does elect to return to play for the Pistons. Although he may have to deal with idiot fans like this. Either way, we wish him the best of luck for the rest of the year in Madrid. Well folks, that’s all we’ve got for now. We’re really looking forward to following these guys as the NBA season starts – and we’ll be sure to keep you up to date on how they’re doing.